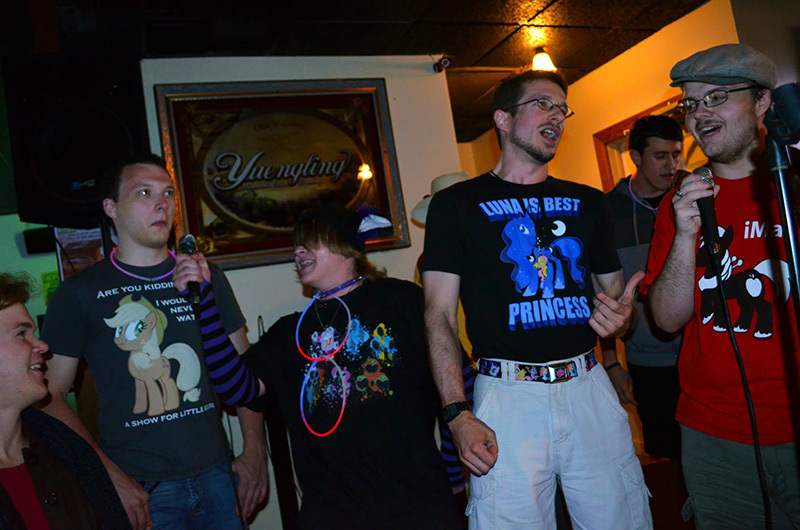 Nightmare Moon has thrust all of Equestria into eternal darkness and seems to be neigh unstoppable. But Twilight Sparkle, having seen the signs of her return in a book, has another book ready (it’s under “E”) that can help bring an end to the endless night! Accompanied by her newfound friends, Twilight ventures into the mysterious Everfree Forest to search for the most powerful magical artifacts in all of Equestria: the Elements of Harmony. Nightmare Moon, not one to simply sit around and wait for the protagonists to foil her plans, does her worst in an effort to trip them up along their journey. Little does she realize, her meddling catalyzes the spark that activates the Elements in a very different way, and the rainbow friendship cannon that Twilight and her newly-bejeweled friends unleash sends the nightmare packing. Twilight’s reward for saving the land from eternal darkness? A new life in Ponyville to study the magic of friendship! Stand back you foals! The horse puns have begun! Okay, “everypony” was dropped on us a few times last episode, but in any case, these little gems are going to become your best friends. Or the bane of your existence. They’re going to be galloping out of the gates, though, so might as well make your peace with them sooner rather than later. The end of the last episode and the beginning of this one is the first time we see how the general citizenry of Equestria (well, Ponyville anyway) reacts to real danger: curiously. And by “curiously” I mean lots of standing around and gawking rather than trying to run for safety or valiantly attempting to swarm and subdue the aggressor. (To her credit, Mayor Mare did sic the Royal Guard against Nightmare Moon, but she might as well have tossed a couple gnats at a lawnmower.) Granted I don’t know exactly how I would react were a 1000-year-old eldritch phantasm to suddenly appear and threaten eternal darkness on the eve of a sun festival, but I would expect more of the usual “fight or flight” response. I know I’m cheating and making forward references here, but perhaps one could overanalyze this as being the result of a kind of “Boy who Cried Wolf” syndrome that the poor residents of Ponyville seem to have to put up with on a regular basis: “whelp, here’s yet another thing that might destroy the entire town, I guess I should freak out but I’m still tired from yesterday’s calamity, lemme take a nap first and then I’ll see if I have time to run around screaming before it’s time for lunch.” I’m sure there’s a trope for underwhelming reactions to legitimately dire circumstances or overblown reactions to relatively minor issues; maybe Noel or Tessa know what it’s called! Or maybe they just know which fights to pick, as the Mane Six (horse puns!) seem perfectly willing to throw down with a manticore. I do have to say, Applejack’s casual “All yours, pardner,” to Rainbow Dash as she is flying through the air after being hurled off the manticore’s back really tickles me for some reason: these two characters have such a great dynamic, and it’s clear here (and previously when we see AJ grabbing onto RD’s tail in a manner that suggests it’s neither the first nor last time that will happen) that these two have both butted heads and shared some good cider together over the years. Anyway, as far as stuff that happens in this episode goes, we get to see each character’s Element of Harmony shine through her actions on the way to the palace ruins in the heart of the Everfree Forest. Each “champion” more or less does what comes naturally at her respective trial, often to the astonishment of her peers. I think is a fantastic way to go: the strength to overcome adversity need not come from some mysterious superpower or crazy talent but can be found in simple, sound moral values. What better message to give to the target audience than this? Or any audience, for that matter? I mentioned last time that I prefer characters that “start normal” and become extraordinary through character development; here we see, clear as day (despite it being eternally night), characters doing what is “normal” to them and becoming extraordinary in the process. That’s a slam dunk for me. I love it the first time I hear it (very rare). I’m iffy the first time I hear it, but after a few more listens I really warm up to it (very common). I eventually appreciate the song though only after hearing some good remixes (quite common). I only really like the remixes; the original just doesn’t do it for me (very rare). The song in this episode is somewhere between 2 and 3 for me; I think it wasn’t until I heard Saltlakrits 20% Cooler Remix (which was also included in an In The Groove song pack with a wicked ending step sequence) that I warmed up to it. The song does kind of emphasize what I mentioned above about the odd reactions that ponies have to threats, too, namely in that the “fight or flight” response of ponies in Equestria seems to be… well, not so much backwards as, er stochastic. What will scare and what will embolden seems to be an entirely nondeterministic process. And then there’s Luna. She got all of, what, two lines and a minute of screen time, and yet the Internet absolutely exploded. Seriously, the amount of “I’m sad on the moon” fanfiction, fanart, and fan music about her that came out this one episode is staggering. I may have joined in somewhat, too. Best princess. Also, best use of wings for something other than flying. I don’t think this scene gets topped until Season 4 rolls around in terms of awesome wing usage. Non-wing-related, we hear the term “cutie mark” for the first time this episode… but that’s a topic for a future deconstruction. Aha! See? I made it through the entire deconstruction without making the obligatory Lion King reference to Applejack and Twilight on the cliff… oh, wait, ponyfeathers. What really works about this episode are the characters. Even beyond them representing the core elements, we still go past those tropes which, in most other shows, would leave everyone an archetype. 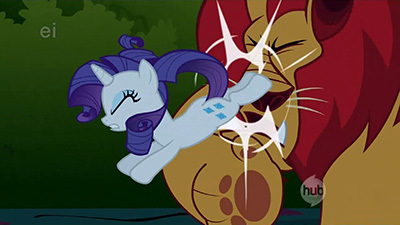 The first person to physically take on the Manticore is neither Rainbow Dash nor Applejack, but Rarity, with a full on double hoof-stomp (there you go, Gerf) to the face. 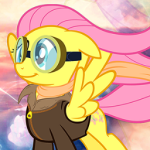 Fluttershy’s lesson isn’t just about being kind to the creature, but to raise her own voice loud enough to tell her friends to stop when she sees them doing the wrong thing. Rainbow Dash is about NOT diving into rough and rowdy battles, but doing the simple act that helps her stranded friends. Applejack’s is probably the best moment as she’s looking into the eyes of a person believing themselves to be hanging just above near death, and telling them that it’s okay to let go. And Pinkie Pie teaches us to never discount alphabetization. These are all strong moments, and it’s great, now that we’ve gotten through introductions, to see everyone working as a group and playing off of one another. Gerf already pointed out Applejack and Rainbow Dash, and it’s interesting that the former holds back the later at the one point, but against the Manticore, Applejack is the first of the two to dive in, then tags Dash in upon being hurled out. They’re the rowdy ones, but at different levels, and we see similar teamwork between Rainbow Dash and Fluttershy as the winged ones. The other dynamics are more the singular vs the group as Pinkie Pie is often the gleeful outlier, standing out during casual trots as she bounces up and down and approaches everything in a way so outside the box that it’s usually the simplest answer. Rarity is always leaving the others in awe at her poise and beauty, but she wins deeper respect through compassion and sacrifice. Twilight is the one who actually knows what’s going on, and seems to fall into a leadership role, but it’s one where they’re all still equals as a group, as the trust between them is still being formed. It’s all interesting stuff and full of wonderful moments… but the episode still doesn’t work very well for me overall. The bulk of it is a very forced chain of sequences that feel artificially constructed to highlight each ponies’ strengths, and by the time we got to the sea serpent (though I will say, I love the animation of the rolling rapids he was causing), I started tuning out because it was becoming pretty obvious how each scenario was going to unfold. I know, I know, this is a kids show, and the artifice of events is explainable by Nightmare Moon’s orchestration, but it still plays hollow to me. The cliffside breaking off, where it’s a sudden thing instantly dropping our characters into the moment, that worked wonderfully, but other sequences drag, like the sea serpent, like the Manticore sequence (I’m genuinely surprised they went with the basic “thorn in his paw” bit), like Pinkie Pie’s musical number, like Rainbow Dash struggling about whether or not to join a group of ponies who would have been much more interesting had they actually been real instead of illusions (maybe they will be, we’ll see, but not here). There was a lot of wheel spinning and plot grinding as everyone was highlighted through basic, predictable fables. And then came the last five minutes, and it was as though I’d missed a chunk of episodes and jumped straight to the end of the first season, as it felt much more like the climax of a broader, multi-episode narrative than it did the start of one. Each character coming to embody an element? That could have been much more richly explored through full episodes over the season than all shoehorned together as this string of circumstances. Twilight Sparkle moving away from her doubting of this “crazy” town and its unconventional inhabitants, as she comes to trust them and form the deep bonds of friendship? That needed a heck of a lot more space to build than mere introductions followed by 15 minutes of walking through the woods. The looming, apocalyptic threat of the return of Nightmare Moon? Why not have that be a rising background presence occasional swooping into the main plot over the course of the show, instead of the random cloud of sparkling mischief here. And the element crystal thingies? Hey look, they’re all grouped together in one location, and the puzzle of how to make them work is solved right away, instead of being this gradual, arc-spanning quest as both good and bad try to be the first to find each one as their meaning is gradually uncovered. This feels like way too sudden of a wrapup, sweeping all of these interesting story threads under the rug as quickly – and, frankly, sloppily – as they possibly can so as to clear the stage for more quirky small town antics. Which surprises me, as the quirky small town antics and this broader epic plot are not mutually exclusive, and could play off one another in really interesting ways. The others know this show, and I don’t, so maybe everything I’m pointing out above does actually happen at some point. But the fact that it doesn’t here, that they just so quickly do away with so much of what they set up, does mute my interest a bit. I’m still looking forward to the remainder of show, but not as much as I was last week, and I need to retune myself to where it’s actually heading instead of where I was hoping it would go. 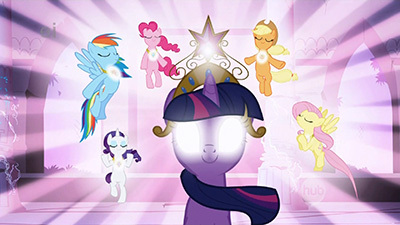 The ending stuff is nice, with Luna shedding Nightmare Moon and setting up an interesting character to explore, Princes Celestia telling Dorothy she had the power to return home all along, everybody being friends and Twilight getting to stay and big cheers for all. It’s a nice “ending”, it just doesn’t feel like this was the right time for us to get there yet, that the show hasn’t yet earned it. Alas, we’ll see where we go from here. I hinted last episode that this was the half of the opening two-parter that falters a bit for me. To be clear, I still absolutely love this opening, and a lot of my critique is softened a bit by the fact that as an overall whole, this opener just works so well for me still (I genuinely teared up during the climax), but I can’t ignore that it’s dragged down a bit by really two major flaws; first, some of the “elemental trials” are kind of hamfistedly dealt with, and second (and probably the more egregious) is that Nightmare Moon isn’t really used all that effectively as a villain, especially for what could be called the first “Big Bad” of the series. Before I delve into that, however, I want to actually hit on what I think is still great about the episode. Noel and Gerf already touched on it, but the actual individual character moments in this episode really are great. While they were arguably firmly in secondary character roles last episode, this is where the non-Twilight members of the “Mane 6” (get used to that moniker for the main cast, we’ll be using it a lot) get to step up into their main character roles, as the episode very quickly moves forward with the cast as an ensemble front and center throughout (Spike even bows out almost completely for this episode to make room for them). Despite what I’ll be saying shortly about the challenges throughout the episode, the way in which everypony deals with them is quintessentially “them”, and the strength of the characters shine through as we get a very good (if still somewhat surface-level at this point) look at the parts they play in the overall group. I have something of a fanon theory (and probably a safe one to make, as there’s evidence to back it up throughout this first season) that Twilight is actually bringing the six of them closer together at the same time that they’re bringing her into their fold. While the others obviously all knew each other and had friendships among themselves (and those social circles did all intersect in some way), I’m not sure all of them were as close as they’ll inevitably become right off the bat (there’s at least two examples of members of the group who probably weren’t BFFs pre-Twilight entering the fray that will come up fairly quickly within the coming episodes). That said, it’s obvious that some of them have clearly spent a lot of time together and are close enough even now to gel pretty well and know how to lean on each other in conflict. Applejack and Rainbow Dash come immediately to mind (and were specifically pointed out twice in these writeups already), with Applejack knowing when to hold her friend’s rambunctious nature back and when to give her the go-ahead encouragement to go all-out (even if mistakenly). The two have great chemistry together even this early, and, amusingly enough, it’s very much worth mentioning that both are voiced by the same person. Speaking of the voice acting, it’s something we haven’t gotten around to touching on yet, and probably really should, because the quality of it is one of the great strengths of the series. Of course, you have Tara Strong (who you’ve likely heard before if you’ve watched or played anything with extensive voice acting) as the voice of Twilight doing her thing, and doing it fantastically (although occasionally when Twilight gets shouty she drops a bit into Timmy Turner); Ashleigh Ball and Andrea Libman both pull double duty voicing Applejack and Rainbow Dash, and Pinkie Pie and Fluttershy respectively, and both are great at differentiating the voices enough that neither ever really bleeds into the other (with some exception on the part of Flutterpie, usually in song); Tabitha St. Germain voices Rarity and puts in a great performance also, but also lends her voice to a lot of secondary characters, she did (and will continue to do) Granny Smith last episode and voices Nightmare Moon/Luna in this one. There’s so many more perfomances that are worthy of note, and I could just continue to go down the list for all of them (and likely will give shout-outs to individual VAs as the series goes on), but it would stretch out this part of my write up by a ton, so suffice to say that everyone does a fantastic job and is awesome. And we have our first song of the series (minus the opening theme, of course)! Giggle At the Ghosties is still one of my favorites, largely due I think to nostalgia, although it’s going to wind up being dwarfed by much better songs down the line, even just from this season. It was actually somewhat odd coming back to this episode and listening to it again through the filter of being able to compare it to stuff from the more recent seasons. Again, I like this song a lot, but this is just a very faint echo of so much more to come down the line. Daniel Ingram writes the songs for the series, and puts out some amazing stuff (it’s not an accident that a huge portion of the fandom works rests on the musical end, and an awful lot of it is taking his songs and running with them), and this is a decent start, but I have to admit that it probably doesn’t rank very high on the overall song list. Worth pointing out here is that Pinkie’s singing in this episode is being done by Shannon Chan-Kent, who will sing most (but not all) of Pinkie’s parts in the series when it comes to songs (likely because of the aforementioned difficulty for Andrea Libman to keep Pinkie and Fluttershy’s voices distinct in song, although she does get much better at it as the series goes on). 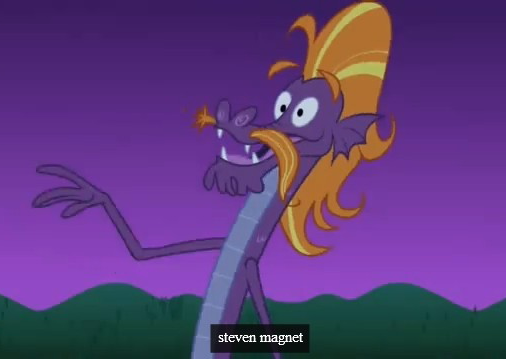 I said I was done with shouting out to the voice actors, but just to throw one more out, the sea serpent (whom fans dubbed Steven Magnet due to a very glitchy youtube transcription) is voiced by Lee Tockar. It’s unfortunately his last (at least to date) appearance as the fabulous sea monster, but he’ll be back shortly voicing other, longer-lasting characters. I also wanted to note about the ponies’ reaction to Nightmare Moon’s return, that I’m not sure that it’s so much a case of them standing around passively gawking as it is just them all being lost in genuine confusion. One of the things I actually like about this setup of the mythology is that Nightmare Moon (and Luna in general) has just been flat out forgotten about over the years. There’s been stories of a Mare in the Moon and Nightmare Moon, but the concept as delivered appears to be that neither at this point are taken very seriously, and it’s unclear even on that level how many ponies are familiar with the legend. It’d almost be like if Santa Claus crashed a State of the Union address and decided to proclaim eternal winter just because, only even then it’s not a great comparison because we actually would at least recognize who the figure was. The implication here seems to be that the ponies (minus Twilight) just don’t have the dangest clue who just crashed their party, and they’re understandably left dumbstruck. It becomes extra interesting when you take this even further with the Mane 6’s (even Twilight, who if anypony would be in a position to know, it’d be her) genuine show of surprise at learning that Luna is Celestia’s sister, giving the idea that Celestia’s status as an ancient (she’s at least 1000 years old and the implication is that she’s significantly older than that) deity-esque being may not even be super clear among modern ponies. They clearly know she’s their ruler and that she’s responsible for raising the sun and the moon both (at least prior to Luna’s return), but it’s up in the air whether or not they understood in full what that actually meant, which means either that they’re not particularly observant or that Celestia has intentionally played down her position all these years. On a last brief note before I change direction, I love Twilight’s hesitation during her Big Dang Hero speech. It’s brief, and she powers through it, but it suggests that she’s really just making all this up at the top of her head, and makes the whole thing feel a lot more real to me. Right, so, onto the problems. Overall I don’t have much issue with most of the elemental challenges themselves (although Noel is right that the pacing is somewhat off and the actual scenes themselves are pretty simplistic)… however, Applejack and Rainbow Dash specifically sort of wind up with really awkward scenarios that wind up coming off as somewhat forced. It’s so clumsily done that the idea that the two of them were mistakenly given the other’s element has become something of a fandom joke (probably best lampooned in the parody series Friendship is Witchcraft). Applejack’s actual scene isn’t in itself bad, and neither are her actions in it (like I said, she’s perfectly in character for the whole thing), but as a measurement of her honesty, it’s kind of a really weird scene. You have to do backflips to connect the dots between her actions being reflective of her being a fundamentally honest pony in the situation, since they aren’t really about being honest so much as having trust in her friends and being able to convince Twilight to do the same. In that way, without even really tweaking anything (save for maybe dropping the very awkward “honest truth” line since you wouldn’t need to drive the point home with a hammer) her scene would have made a fantastic loyalty challenge; sometimes the most difficult show of loyalty to your friends is to trust them enough to let go of control of a situation you can’t handle yourself so that they can help you, and that’s exactly what Applejack is actually doing here. Instead, the square peg is being awkwardly shoved into a round hole to make it a lesson about honesty. Rainbow Dash, on the flip side, actually does have a decent setup for her challenge relating to her element, but the execution sort of falters. In the context of the episode itself, it isn’t particularly bad, but cheating a bit and stepping back and looking at the overall whole, the Rainbow Dash we’ll come to know really might have said yes to the Shadowbolts feeding into her ego (more than one of the fandom portrayals of alternate tellings of this opening have had her taking the bait here). As it stands, she sort of doesn’t fall for it here because the script says she shouldn’t (as well as Nightmare Moon sort of blundering and tipping her hand by being just a little too pushy, but more on that in a bit). We get more awkward lines here in the form of a “yes and by yes I mean no” in order to try to force suspense, making what could have been a very interesting turn a bit too easily overcome and shrugged off. I sort of wonder if, when the series was originally conceived as a longer Sailor Moon-esque adventure arc, Rainbow Dash was originally supposed to fall to the other side, and through her struggles there discover her own element of loyalty. I don’t know, and I could be way off on that, but I feel like there’s a small taste of a plot thread that may have had to get cut entirely due to not even remotely fitting into the show’s structure as decided. I should mention that both Applejack as Honesty and Rainbow Dash as Loyalty will have great things done with them down the line, although there will equally be examples that will pop up in the course of the show that do lend credence to the idea that the two really should have been flipped, and some other scenes come up with that whic allow the often tactless and blunt Rainbow Dash to step in as the element of honesty. Just to expand on it a bit more, it’s worth mentioning more clearly that Lauren Faust originally was interested in trying to make the series into a longer adventure series with a clear story arc, but ultimately was forced to discard that idea in favor of a more slice-of-life style series with occasional longer adventure plots. I sort of get the feeling that what we’re seeing in the opening here might be a very condensed version of that original arc, and a lot of the story elements would likely have been drawn out much more and given more time to develop (as it is, the crew has noted that they had to cut quite a bit off of these first two episodes for time, which happens often with all of the episodes but that this opener specifically was a challenge in that regard). Which brings me to the other issue with this episode… for all of her build up last episode, Nightmare Moon proves to be kind of underwhelming. Before you grab those torches and pitchforks and call for my head, let me clarify that I’m not talking about Luna as a character. Luna will eventually prove to be a very interesting and well-used character down the line, and I love her to death (also, get a good look at her original design now, because it’s the last time we’ll see her before her redesign next season). I’m specifically talking about Nightmare Moon as a villain, who works so much better in concept than she winds up working in practice. There’s the issue of her falling very quickly into “easily defeated villain” tropes, where she makes her grand appearance and then sort of just leaves, from which point all of her attempts to stop the main characters happen indirectly rather than simply directly confronting them head on. On top of that, the roadblocks she’s throwing in the way of our heroes are essentially handing them the keys to their victory, since she’s inadvertently teaching them their own elements in the process and putting Twilight in situations where she’s recognizing how much she needs them. On top of that, by intentionally stopping along the way at all points to try to slow them down, she slows herself down in the race to find something that, arguably, she’s the only one in the situation who should know where it is already. It all falls down under fridge logic because really, there’s so many ways Nightmare Moon should have been able to win outright that it starts to feel like she just sort of laid down and let the Mane 6 end her short-lived reign of terror. Unless, of course, that was the point. 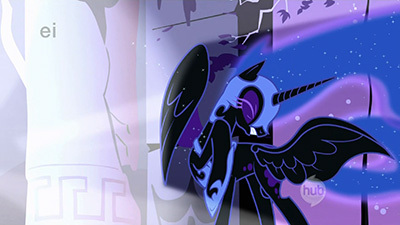 Another problem is that the mythology of Nightmare Moon is in the unfortunate position of becoming more convoluted every time the series attempts to delve into it (it will several more times in the show and once in the comics). It’s not really the fault of this episode, but Nightmare Moon as a concept will become more confusing and less impressive over time as the continuity of the whole thing winds up sort of hiccuping whenever she’s brought up. Again, I could see this being a casualty in the change-over from adventure series to slice-of-life. Nightmare Moon may have originally had more planned out for her (I could see her being a very effective Queen Beryl to the Mane 6’s Sailor Senshi, or potentially even a Queen Metaria later down the road). I don’t think she’s the clumsiest implementation of a villain in the series, or the biggest waste of potential (King Sombra will run away with both of those awards easily in Season 3), but I do think every other villain introduced in the series makes a stronger showing in their particular stories than she does. And yes, I’m including Sunset Shimmer in that list. Okay, now you can pick up the torches and pitchforks. [UPDATE : Oh man, I forgot just how small a statement this was that wound up spiraling so far out of control in the next few discussions, and it’s completely inaccurate! I’m totally embarrassed to admit this, but it turns out that I was pretty much echoing what I didn’t realize was effectively a rumor based in a game of internet telephone and not actually fact – the series was never intended to be anything different from what it was from the start (episodes actually LENGTHENED from what they were originally set up to be, hence AKR and Lauren Faust sharing writing credits on Ticket Master, which was the first episode written and had to be doubled in length). Please disregard any of the conversations in the following episode discussions where we go running off on tangents about what the show was originally intended to be, because we’re wrooooooong. So very, very wrong. And it’s largely my fault, because I was the one to plant that little tiny seed at the very end of my post here. I have a tendency to take a page from Twilight’s book when it comes to the show and try to be the know-it-all nerd, and I probably need to go re-watch a few episodes and pay attention to the morals again and learn to stop doing that. I promise I’ll try to make sure I ACTUALLY know what I’m talking about in the future. I’m not surprised to learn that this was a somewhat rushed reflection of what the series was originally intended to be, sped through so they could get to what they ultimately decided they should make it. I am a bit let down, though, because as I said, having an over-arching adventure plot and intimate focus on slice-of-life small town antics are not mutually exclusive. It doesn’t need to be one or the other, but can have both, with each sliding in and out of prominence depending on the episode, and weaving in and out of one another in interesting ways. The ending here still lacks weight for me by losing that broader examination. I wonder if the sudden course change is the result of The Hub being a new network at the time, just debuting with this among their flagship titles. It has the feel of nerves and hand-wringing, and I wish they’d have just stuck with the developed plan instead of “fixing” it before even seeing if it was broke. Oh well. We’ll see how it goes over time, as they got more experience and feedback under their belt. Though some of what Tessa says about the future does have me a little worried! To be fair, a lot of my extended NMM rant comes from one episode in particular down the road sort of sticking in my craw (ironically I actually really enjoy said episode for what it has in it, it just also comes coupled with the writers apparently forgetting most of the setup from this two-parter). I’m also unsure just how far down the line plans changed on the direction of the series, just that it originally was intended to involve more overarching plots, but a lot of how the opener plays out makes sense to me as a condensed first arc re-purposed for a pilot. It does bum me out slightly, because I’d really have loved to have seen what was originally envisioned for the series, but not THAT much, because I still REALLY like what we wound up getting in the end anyways. Also to be fair, the series does actually wind up having an overarching plot of sorts from the perspective of Twilight’s own personal arc (she’s going to go a lot of places), it’s simply more loosely tied together with a lot of smaller stories than a point for point start-to-finish adventure tale. Don’t worry, there’s plenty of adventure to be had in the coming episodes, they just wind up being in smaller, largely self-contained chunks. And I understand being let down by the end of this two-parter. While I still really like it, it’s far from perfect (I just basically wrote a novel on why, so yeah). If it helps at all, think of this as setting the foundation for the concepts of the Elements of Harmony for a much, MUCH better implementation of this style of story coming up at some point. Next episode is overall a better introduction to the style of episode that we’ll be seeing this season (and, fittingly, it’s the first episode in the overarching arc that this season deals with, and while there’s no monster at the end of the book to deal with, it’s one of my favorite storylines of the series). I’m also often in the disappointed camp when it comes to the endings of these two-parters (“these” since there will be several!). The writers do a good job at introducing the main villain and building up the suspense, but more often than not the villain gets “dealt with” the same way every time in a very abrupt manner, and despite having 40-some minutes to work with rather than the usual 20-something, said villain doesn’t really get explored more than “LOOK AT ME I’M BAD MWAHAHAHAHAHA–NOOOOOOOOOOOOOOOOOOOOOOOO” and that’s that. This is one of the reasons why I often don’t introduce MLP:FiM to newcomers with these two episodes: they have some fatal flaws (detailed ad nauseum above) that are major turn-offs, and they don’t really capture the essence of the show as well as the individual slice-of-life episodes do. The non-premiere/finale episodes are much stronger as they (usually) don’t feel so rushed and they don’t (always) rely on Magical MacGuffin Muffins to deal with the main conflict (or, when they do, it’s not quite what you’d expect! )… and we still get some pretty memorable antagonists out of them! That and I think they do a better job at exploring the characters, which is one of the show’s biggest draws for me. As for Nightmare Moon, my method of “coping” with the wasted potential of the character has been to turn to the fan community, particularly the fanfiction. Past Sins, Upheaval: Breaking Point, and Upheaval: Reckoning provide some interesting takes on the Nightmare Moon bit, namely that it’s more of an external spirit/demon/something that possesses others, similar to what we see in arc #2 of the official comics. (I’m sure there are many others that explore this as well, but I can’t recall them at the moment and/or haven’t gotten around to reading them.) Fanon != canon, of course, but that doesn’t mean fanon can’t do a better job at fleshing out characters than the canon sometimes! Although, I’d argue that this series manages to nail at least one. Possibly more if you don’t mind others not being perfect.